I’ve spent almost 100 hours in the Witcher 3, wandering the streets of Novigrad, galloping through Velen’s windswept woodland, sailing between the isles of Skellige. Yet in all that time, I never really stopped to enjoy the game’s quieter moments. There was so much to see and do that I didn’t have time to stand in a meadow and admire the sunset, or watch the world’s inhabitants go about their business. As I raced through villages on missions or monster hunts, I grew curious about what was going on away from the quests and story. I began to wonder how much simulation is actually occurring among the world’s populace, what their daily routines are like, and how much they interact with one another. With this in mind, I decided to dedicate an entire in-game day to walking around a single village, observing the population without interacting directly, and keep a detailed account of what I saw. As the location for my little experiment, I chose the village of Midcopse. 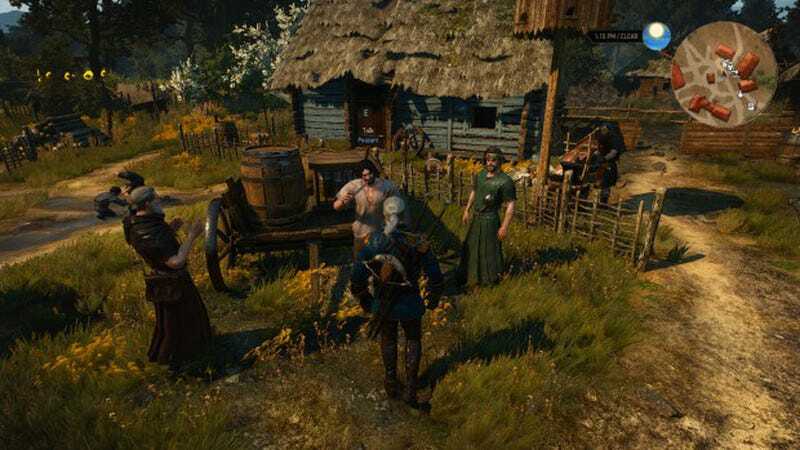 Located in Velen, Midcopse is fairly typical of the peasant settlements you pass through while playing. It’s small enough to traverse quickly, yet large enough to have a sense of bustle about it. Time-wise, I figured that a new day starts just after midnight, so I’d begin my diary then. But I didn’t want to fast-travel directly into Midcopse. I wanted to ride there from a nearby location, spend the day in the village, and then ride out. That way the game had to run its simulation constantly, minimising any opportunities to shuffle things about behind my back. With a plan in place, I fast-travelled to the Pellar’s Hut close to Midcopse, meditated until 10pm, and rode in from there. Unfortunately I misjudged how long it would take to get from the Pellar’s Hut to Midcopse, and ended up riding in at 22:11 exactly. Given it was night-time, I expected the streets to be empty, but there were several people milling about. A man smoking a pipe outside his hut announced “Welcome to our shithole,” as I passed by, while a few men and women labelled “Pillager” shuffled about in the village centre. I suppose it could be worse. It could be Blackpool. The pillagers were set on basic linear patrol paths, walking between containers and rummaging through them. But I spotted a woman who seemed to be wandering in and out of the village. Between 22:45 and 23:00 I followed her around in a not-at-all-stalkerish fashion. Her walk took her just outside the village, at which point she cut through some hedges and walked back along a row of houses toward the centre. Thrilling. With little going on in the streets, I decided to check out the buildings. I entered a house and, in a shock twist, everyone was asleep. Except for a little girl, who was slumped against the wall, her head tilting lazily from side to side. She asked me if I was going to kill monsters. Not tonight little one! This Witcher is merely a spectator. Sleep well! In the next house I checked, around 23:30, there were two more sleeping villagers and a little boy. The boy was also awake, and also slumped against the wall. He told me quite cheerfully that his dad used to have a sword once. It appears Velen’s peasantry aren’t too fussed with getting their children to bed at a decent time. At this point I went back outside, and noticed the woman I followed earlier was headed out of the village again, only in the opposite direction. So with nothing better to do I followed her again, and this time she meandered around the outskirts in a much larger circle. This, it seems, is how the Witcher creates the illusion of foot traffic, by carefully looping characters through settlements. After these I went back to the houses where I saw the children, curious to see if they were still awake. Sure enough, they were. The boy started singing a rude nursery rhyme. Go to sleep you rapscallion! I then headed up the path to a house situated at the southwest corner of the village. There I discovered two more children and again they were both wide awake, heads lolling in unison. By now my curiosity was quickly shifting to concern. I don’t think children in The Witcher 3 sleep. Ever. They just sit and stare blankly at the wall, all night, every night. Oh god, I intended this to be a fun little experiment, and now I’ve stumbled upon a secret creepier than a Water Hag’s Tinder page. I edged out of the doorway, leaving the pint-sized insomniacs to their hypnotic head-rolling. At 02:40 the sky began to brighten, so I started dashing between houses trying to spot the first peasant to awaken. Just shy of 4:00 AM I lucked out, bursting into a shack just in time to see a woman rising from her bed. Paying no mind to the Witcher gawping at her, she shuffled outside, coughed into her hands for just under an hour, and then went back to bed. No, I don’t know either. At 04:30 it began to rain, and the pillagers sloped off into the forest. At 5:00 exactly the village awoke in unison. Men and women shambled out of the huts into the dawning light, and immediately set to work. My attention was focused on the children, who seemed entirely unaffected by their sleepless night. At 5:30 I noticed a girl playing with mud in the street, and just outside the village, the siblings I stumbled upon last were throwing stones into a pond. At a glance, the detail of The Witcher 3’s environments really is stunning. While the children of the village were happy to mess around in the mud, the adults were much more noticeably affected by the rain. Many hid under the eaves from the downpour, while those who kept working spoke in single sentences, mostly to complain about the rain. At 11:25 I went indoors, mainly to get away from the downpour. An old woman sweeping her floor told me to stay away from the swamps, which is good advice, only Midcopse is nowhere near the swamps. Finally, at 13:00 exactly the rain stopped. I was so happy about this that I broke my “no interaction” rule and threw a bomb in celebration (it was the closest thing I had to a firework). The explosion frightened two children playing in a puddle. They screamed and ran around in circles, before returning to their muddy fun as if nothing had happened. With the sun out, the mood of the village visibly brightened. Almost everyone set to work, washing clothes, mending fences, sharpening scythes. They also began engaging in proper conversations, some of which were clearly scripted, while others were more procedural. For example, a woman wandered right around the village, gossiping with various people about some bags of millet the Crones left out for another villager. Each response was different, though usually variations on the theme of “I don’t want to know about it”. Not exactly surprising. Millet’s a terrible subject for engaging patter. Everyone knows wheat is where it’s at. The change of tone between among the villagers between rain and sunshine was impressive. But the novelty quickly wore off. After an initial tour of Midcopse in the sun, taking note of different animations or patrol paths, in the following four hours I saw nothing new or intriguing. Most villagers remained exactly where they were for the duration of the day. None of them stopped to eat or drink or perform any of the other basic necessities of life, as they might in the Elder Scrolls games, say. What’s more, as dusk drew near, the NPC “barks” really started to grate. Many villagers are coded to say the same things every time you pass them, which is fine when you’re racing across the world on horseback, or stopping off to get your sword repaired. But over any longer period of exposure it becomes maddening. This reached peak absurdity at around half seven in the evening, when two villagers started separate conversations with exactly the same phrase at exactly the same time. It felt like the game was actively mocking me, revelling in the fact that it’s life simulation is shallower than a Californian aquifer. The tedium continued until exactly 9pm, when everyone downed tools and headed straight to bed. As the villagers retired, the pillagers crawled out of the woodwork, and I decided I’d had enough of Midcopse to last a thousand years. I left the village at 21:30. As I walked toward the forest, accidentally bumped into a man. “I didn’t do nothin’!”, he shouted. You said it mate. I left Midcopse feeling rather deflated, as well as a little freaked out. But I’m not altogether surprised by what I found. The Witcher 3 is a huge, huge game, with what must be thousands of characters inhabiting its world. To give those characters any kind of autonomy or dynamism would be a QA nightmare, and that work simply wouldn’t be worth the payoff because most of the time the player would fly right past it. I think the disappointment stems from the fact that The Witcher 3 is so good at humanising its minor characters elsewhere, through their dialogue and dealing with their often morally knotty problems during quests. To see this humanity break down like a malfunctioning mannequin at a theme park is more striking in its dissonance than usual. My advice to you would be, don’t hang around in a village The Witcher 3. There’s a whole world to explore out there, so don’t waste your time in it listening to peasants gossiping about millet.